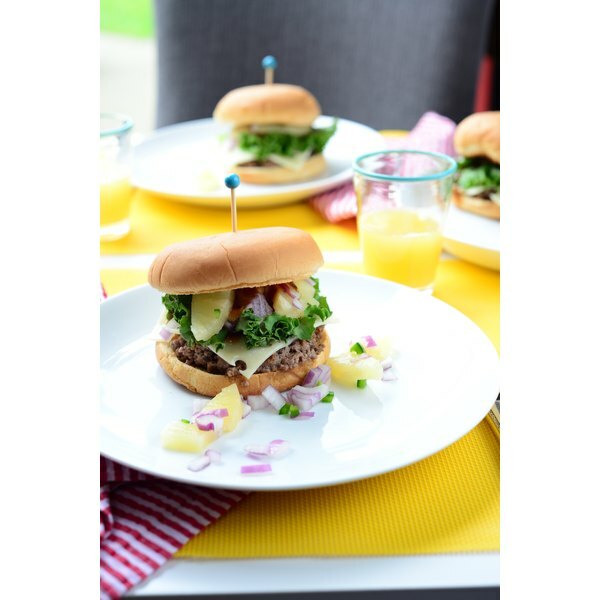 There are few things better than a summer barbecue, and we're bold enough to say that the crowd-favorite way to celebrate is with fresh hamburgers (vegetarian? try this portobello option!). Add some watermelon sides and yummy cocktails to the mix... you're set. This recipe screams summer with the addition of sweet pineapple salsa and teriyaki. In a saucepan over low-heat, cook together soy sauce, 1 cup reserved pineapple juice (drained from the can), 1 tsp grated ginger, grated garlic, and brown sugar until bubbling. In a small bowl, whisk together corn starch and 1/4 cup water - quickly whisk into the bubbling pan and cook one minute until thick to create your teriyaki sauce. In a bowl, combine ground beef, 1 tsp grated ginger, 1 egg beaten, and 1/4 cup teriyaki sauce that you just made. Mix until well combined, form into patties. Chop pineapple slices from can and combine them in a bowl with jalapeño and red onion. Set aside for pineapple salsa. Cook hamburger patties in a grill pan on the stove or on the barbecue until a meat thermometer reads 135 degrees. Butter he buns and grill them alongside the burgers. Spread mayonnaise on one side of the buns and top with hamburger patty, pineapple salsa, lettuce, a slice of swiss cheese, and a spoonful of teriyaki sauce. ENJOY! Share a pic of your creation on Instagram tagging #leaftv and @weeknightsociety! How do I Cook With the Brinkmann Gas Grill? What Kind of Cut of Meat Is a Bottom Round Roast?